Objectives To compare re-rupture rate, complication rate, and functional outcome after operative versus nonoperative treatment of Achilles tendon ruptures; to compare re-rupture rate after early and late full weight bearing; to evaluate re-rupture rate after functional rehabilitation with early range of motion; and to compare effect estimates from randomised controlled trials and observational studies. Data sources PubMed/Medline, Embase, CENTRAL, and CINAHL databases were last searched on 25 April 2018 for studies comparing operative versus nonoperative treatment of Achilles tendon ruptures. Study selection criteria Randomised controlled trials and observational studies reporting on comparison of operative versus nonoperative treatment of acute Achilles tendon ruptures. Data extraction Data extraction was performed independently in pairs, by four reviewers, with the use of a predefined data extraction file. Outcomes were pooled using random effects models and presented as risk difference, risk ratio, or mean difference, with 95% confidence interval. Results 29 studies were included—10 randomised controlled trials and 19 observational studies. The 10 trials included 944 (6%) patients, and the 19 observational studies included 14 918 (94%) patients. A significant reduction in re-ruptures was seen after operative treatment (2.3%) compared with nonoperative treatment (3.9%) (risk difference 1.6%; risk ratio 0.43, 95% confidence interval 0.31 to 0.60; P<0.001; I2=22%). Operative treatment resulted in a significantly higher complication rate than nonoperative treatment (4.9% v 1.6%; risk difference 3.3%; risk ratio 2.76, 1.84 to 4.13; P<0.001; I2=45%). The main difference in complication rate was attributable to the incidence of infection (2.8%) in the operative group. A similar reduction in re-rupture rate in favour of operative treatment was seen after both early and late full weight bearing. No significant difference in re-rupture rate was seen between operative and nonoperative treatment in studies that used accelerated functional rehabilitation with early range of motion (risk ratio 0.60, 0.26 to 1.37; P=0.23; I2=0%). No difference in effect estimates was seen between randomised controlled trials and observational studies. Conclusions This meta-analysis shows that operative treatment of Achilles tendon ruptures reduces the risk of re-rupture compared with nonoperative treatment. However, re-rupture rates are low and differences between treatment groups are small (risk difference 1.6%). 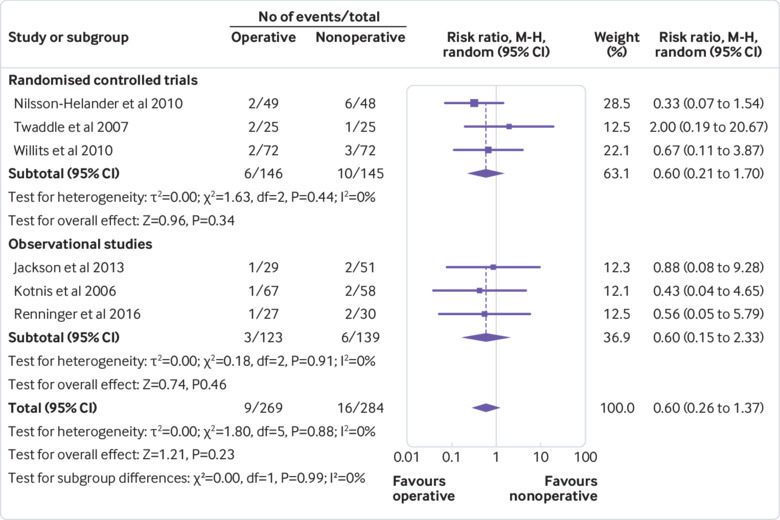 Operative treatment results in a higher risk of other complications (risk difference 3.3%). The final decision on the management of acute Achilles tendon ruptures should be based on patient specific factors and shared decision making. This review emphasises the potential benefits of adding high quality observational studies in meta-analyses for the evaluation of objective outcome measures after surgical treatment. The primary aim of this systematic review and meta-analysis was to compare re-rupture rate, complication rate, and functional outcome after operative versus nonoperative treatment of acute Achilles tendon ruptures. Secondly, we sought to evaluate re-rupture rate after early and late full weight bearing and compare re-rupture rate after functional rehabilitation with early range of motion. Finally, we compared effect estimates obtained from RCTs and observational studies. 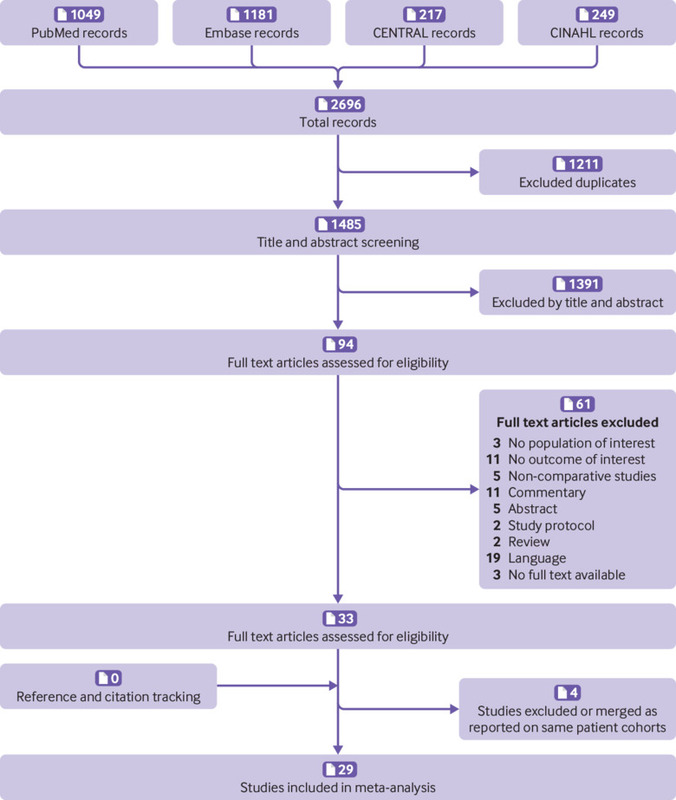 This systematic review and meta-analysis was performed and reported according to the Meta-analysis Of Observational Studies in Epidemiology (MOOSE) and the Preferred Reporting Items for Systematic Reviews and Meta-Analyses (PRISMA) checklists.181920 A published protocol for this review does not exist. We last searched the PubMed/Medline, Embase, CENTRAL, and CINAHL databases on 25 April 2018 for studies comparing operative versus nonoperative treatment of Achilles tendon ruptures. The search syntax is provided in supplementary table A. Duplicate articles were removed. Two reviewers (YO, RHHG) independently screened titles and abstracts for eligibility of identified studies. All published comparative studies, both RCTs and observational studies, reporting on the comparison of operative versus nonoperative treatment of acute Achilles tendon ruptures were eligible for inclusion. After title and abstract screening, the same two reviewers (YO, RHHG) independently reviewed full text articles. Inclusion criteria were acute Achilles tendon rupture, operative treatment (open or minimally invasive surgery) versus nonoperative treatment (cast immobilisation or functional bracing), treatment within four weeks of rupture, age 16 years or older, and reporting of re-rupture rate, complication rate, or functional outcome. Exclusion criteria were delayed presentation (treatment more than four weeks after rupture), treatment for re-rupture, language other than English, no availability of full text article, and letters, meeting proceedings, and case reports. We had no inclusion restrictions based on weight bearing status or functional rehabilitation protocol. Disagreements on eligibility of full text articles were resolved by consensus or by discussion with a third reviewer (RMH). References of included studies were screened, and backwards citation tracking was performed using Web of Science to identify articles not found in the original literature search. Four reviewers (YO, RHHG, RMH, RBB) extracted data independently in pairs, using a predefined data extraction file. The following baseline characteristics were extracted from the included studies: first author, year of publication, study design, country in which the study was performed, study period, number of included patients, operative method, nonoperative method, full weight bearing status, functional rehabilitation protocol, and mean follow-up. Studies reporting on patient cohorts described in previously published articles were excluded or merged. The same four reviewers (YO, RHHG, RMH, RBB), in pairs, independently assessed the methodological quality of included studies by using the Methodological Index for Non-Randomised Studies (MINORS).21 The MINORS is a validated instrument for the assessment of methodological quality and clear reporting of non-randomised surgical studies, resulting in a score ranging from 0 to 24 for comparative studies.21 In this study the assessment of methodological quality resulted in a score ranging from 0 to 24 for RCTs and prospective cohort studies. The methodological quality of retrospective cohort studies resulted in a score ranging from 0 to 18. The MINORS criteria for prospective collection of data, loss to follow-up, and prospective calculation of study size were not applicable to the retrospective cohort studies. Details on the methodological quality assessment are provided in supplementary table B. Disagreements were resolved by consensus. The primary outcome measure was re-rupture rate after operative or nonoperative treatment. Secondary outcome measures included complication rate, functional outcome scores, return to sporting activity, and return to work after operative or nonoperative treatment. We defined complication rate as the rate of complications other than re-rupture. Complications included reports of wound infection, sural nerve injury, deep vein thrombosis, and pulmonary embolism. Functional outcome scores included the Achilles Tendon Rupture Score (ATRS).22 We subdivided functional outcome scores according to follow-up, into short term (one year of less) and long term (more than one year). We defined return to sporting activity as the duration in months before resumption of sports and return to work as the duration in weeks before resuming work. In studies that reported on both open and minimally invasive surgery, we used the combined outcome measures. We present all continuous variables as mean value with standard deviation or range. We converted continuous variables to mean and standard deviation if sufficient information was available, using the methods described in the Cochrane Handbook for Systematic Reviews of Interventions.23 We extracted dichotomous variables as absolute number and percentage, pooled them using the Mantel-Haenszel method, and presented them as risk difference and risk ratio with 95% confidence interval. We pooled continuous outcomes by using the inverse variance weighting method and presented them as mean difference with 95% confidence interval. We used random effects models for all analyses. We assessed statistical heterogeneity between studies by visual inspection of forest plots and by the I2 and χ2 statistics for heterogeneity. We used the overall effect Z test to determine the significance level for treatment effects. All analyses were stratified according to study design—RCTs or observational studies. We assessed difference in effect estimates between the two subgroups as described in the Cochrane Handbook for Systematic Reviews of Interventions.23 The significance level for difference in effect estimates across the subgroups was determined by the test for subgroup differences. We defined the significance level for treatment effects and differences across the subgroups as a P value below 0.05. We assessed potential publication bias by visual inspection of funnel plots with risk ratio and standard error.24 We used Review Manager (RevMan, version 5.3.5) for all statistical analyses.25 We further assessed publication bias with Begg’s and Egger’s statistical tests using Stata 13.1. We did sensitivity analyses for the primary outcome, including studies with an early (four weeks or less) and late (more than four weeks) full weight bearing status after treatment. Studies reporting on both an early and a late full weight bearing cohort were accordingly divided for sensitivity analysis. We did an additional sensitivity analysis for the primary outcome with studies that included an accelerated functional rehabilitation protocol. We defined accelerated functional rehabilitation as the start of early range of motion within three weeks after nonoperative treatment. Rehabilitation with functional bracing systems with successive fixed degrees of plantar flexion, which did not allow for free range of motion, were not considered as accelerated rehabilitation. We did secondary sensitivity analyses for high quality studies and year of study period, regarding re-rupture rate and complication rate. We defined high quality studies as RCTs or prospective cohort studies with a MINORS score of 16 or higher (range 0-24) or retrospective cohort studies with a MINORS score of 12 or higher (range 0-18). We did additional sensitivity analyses with studies that included patients after the study period 2000, to account for the development of new rehabilitation protocols, operative techniques, and nonoperative treatment modalities. The 29 studies included 15 862 patients, of whom 9375 were treated operatively and 6487 nonoperatively. The overall weighted mean age was 41 (range 17-86) years, 41 years in the operative group and 44 years in the nonoperative group. Overall, the studies included 11 779 (74%) males. Overall follow-up ranged from 10 to 95 months. 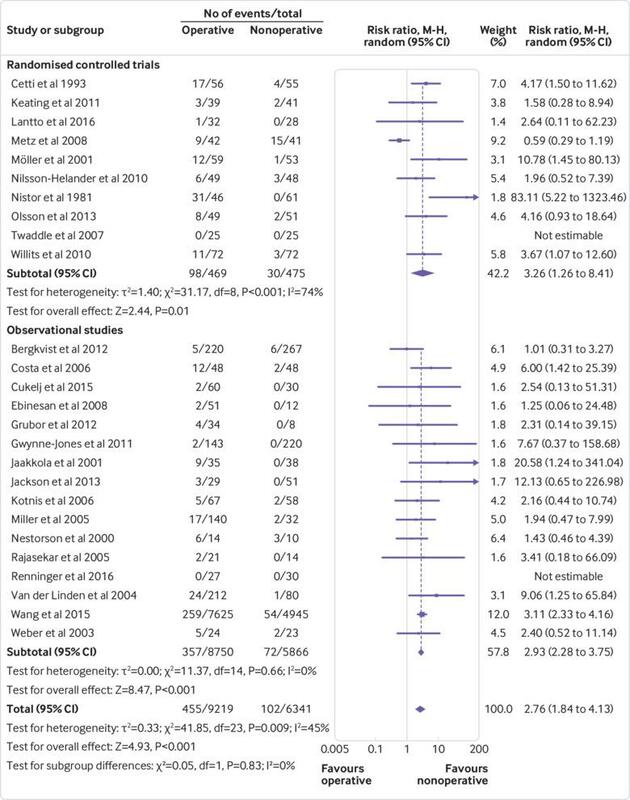 Table 1 shows the baseline characteristics for both RCTs and observational studies. In addition, supplementary table C shows the treatment characteristics of all included studies. The 10 RCTs included 944 (6%) patients; 469 patients were treated operatively and 475 nonoperatively. The weighted mean age was 40 years in both treatment groups, and 779 (83%) males were included. The operative method was open surgery in nine studies and minimally invasive surgery in one study. The 19 observational studies—three prospective and 16 retrospective cohort studies—included 14 918 (94%) patients. Operative treatment was performed in 8906 patients, and 6012 were treated nonoperatively. The weighted mean age in the studies was 42 (range 17-86) years, 40 years in the operative group and 44 years in the nonoperative group, and 11 000 (74%) patients were male. The operative method was open surgery in nine studies, unclear in four studies, and a combination of open and minimally invasive surgery in six studies. The overall mean MINORS score was 14.3 (SD 5.2; range 5-23). The mean MINORS score for the RCTs was 20.3 (2.6; 16-23). The mean MINORS score for the observational studies was 11.2 (2.8; 5-16), 14 (2; 12-16) for the prospective cohort studies and 10.6 (2.6; 5-15) for the retrospective cohort studies. The details and distribution of MINORS scores are provided in supplementary table D.
Re-rupture rate was reported in all 29 studies. The overall pooled effect showed that operative treatment was associated with a significant reduction in re-rupture rate compared with nonoperative treatment (risk ratio 0.43, 95% confidence interval 0.31 to 0.60; P<0.001; I2=22%) (fig 2). The pooled effect of RCTs showed a risk ratio of 0.40 (0.24 to 0.69; P<0.001; I2=0%). The pooled effect of observational studies showed a risk ratio of 0.42 (0.28 to 0.64; P<0.001; I2=31%). Re-rupture occurred in 2.3% of patients after operative treatment compared with 3.9% after nonoperative treatment (risk difference 1.6%). We found no significant difference in effect estimates from RCTs and observational studies (test for subgroup differences: P=0.91; I2=0%). There was no visual asymmetry in the funnel plot (supplementary figure A). The Begg rank correlation test (P=0.66) and Egger linear regression test (P=0.16) indicated no evidence of publication bias. Complication rate was reported in 26 (90%) studies—10 RCTs and 16 observational studies. The overall pooled effect showed a risk ratio of 2.76 (1.84 to 4.13; P<0.001; I2=45%) in favour of nonoperative treatment compared with operative treatment (fig 3). The pooled effect of RCTs showed a risk ratio of 3.26 (1.26 to 8.41; P=0.01; I2=74%). The pooled effect of observational studies showed a risk ratio of 2.93 (2.28 to 3.75; P<0.001; I2=0%). The incidence of complications was 4.9% after operative treatment compared with 1.6% after nonoperative treatment (risk difference 3.3%). Table 2 shows the classification and incidence of complications. The main complication after operative treatment was infection, which occurred in 2.8% of patients. The main complication after nonoperative treatment was deep vein thrombosis, which occurred in 1.2% of patients compared with 1.0% after operative treatment. We found no significant difference between effect estimates from RCTs and observational studies (test for subgroup differences: P=0.83; I2=0%). There was no visual asymmetry in the funnel plot (supplementary figure B). The Begg rank correlation test (P=0.50) and Egger linear regression test (P=0.11) indicated no evidence of publication bias. Long term functional outcome using the ATRS score was assessed in two observational studies. Bergkvist et al reported a mean ATRS score of 83 (SD 19) in the operative group and 78 (22) in the nonoperative group.36 Lim et al reported a mean ATRS score of 85 in both groups.44 No significant difference was found in either study. We did not pool functional outcome data owing to a wide variety in ATSR score reports and insufficient information to convert data. Descriptive details on functional outcome measures are provided in supplementary table E.
Return to sports was reported by four (14%) studies—one RCT and three observational studies (supplementary table E). The mean time varied between six and nine months after operative treatment and between six and eight months after nonoperative treatment. We could not pool data on return to sports in a meta-analysis, as only one study reported a mean and standard deviation. Return to work was reported in nine (31%) studies—four RCTs and five observational studies (supplementary table E). The outcome data of six studies could not be pooled owing to insufficient reporting of information. The pooled effect estimates of three studies—two RCTs and one observational study—showed no significant mean difference between operative and nonoperative treatment groups (supplementary figure C). Early (four weeks or less) weight bearing status was reported in nine (31%) studies—five RCTs and four observational studies. The overall pooled effect showed a significant reduction in re-rupture rate after operative treatment compared with nonoperative treatment in the early (four weeks or less) full weight bearing studies (risk ratio 0.49, 0.26 to 0.93; P=0.03; I2=9%) (supplementary figure D). Late (more than four weeks) weight bearing status was reported in 15 (52%) studies—four RCTs and 11 observational studies. The overall pooled effect of the late (more than four weeks) full weight bearing studies also showed a significant reduction in re-rupture rate in favour of operative treatment (risk ratio 0.33, 0.21 to 0.50; P<0.001; I2=0%) (supplementary figure E). Accelerated functional rehabilitation with early range of motion was performed in six (21%) studies—three RCTs and three observational studies. The overall pooled effect showed no significant difference between operative and nonoperative treatment regarding re-rupture rate (risk ratio 0.60, 0.26 to 1.37; P=0.23; I2=0%) (fig 4). Table 3 shows the results of the secondary sensitivity analyses. Re-rupture rate was reported in 17 (59%) high quality studies—10 RCTs and seven observational studies. The overall pooled effect showed that operative treatment was associated with a significant reduction in re-rupture rate compared with nonoperative treatment (risk difference 5.1%; risk ratio 0.44, 0.30 to 0.64; P<0.001; I2=0%) (supplementary figure F). Re-rupture rate was reported in 14 studies (48%) with a study period after the year 2000—six RCTs and eight observational studies. The overall pooled effect showed a significant reduction in re-rupture rate after operative treatment compared with nonoperative treatment (risk difference 0.9%; risk ratio 0.59, 0.42 to 0.83; P=0.002; I2=10%) (supplementary figure G). Complication rate was reported in 16 (55%) high quality studies—10 RCTs and six observational studies. The overall pooled effect showed a risk ratio of 2.72 (1.44 to 5.12; P=0.002; I2=62%) in favour of nonoperative treatment compared with operative treatment (risk difference 8.8%) (supplementary figure H). Complication rate was reported in 14 (48%) studies with a study period after the year 2000—six RCTs and eight observational studies. The overall pooled effect showed a risk ratio of 2.15 (1.28 to 3.60; P=0.004; I2=52%) in favour of nonoperative treatment compared with operative treatment (risk difference 2.4%) (supplementary figure I). This systematic review and meta-analysis, including both RCTs and observational studies, compared outcomes after operative versus nonoperative treatment of acute Achilles tendon ruptures. The pooled effect estimate showed that operative treatment was associated with a significant reduction in re-rupture rate compared with nonoperative treatment. However, operative treatment resulted in a significantly higher rate of other complications. Sensitivity analyses showed a similar reduction in re-rupture rate after both early and late full weight bearing in favour of operative treatment compared with nonoperative treatment. However, we found no significant difference in re-rupture rate if accelerated functional rehabilitation with early range of motion was used. Sensitivity analyses with high quality studies and studies with a study period after the year 2000 also showed operative treatment to be associated with a significant reduction in re-rupture rate but a higher risk of other complications. We found no significant difference in effect estimates from RCTs and observational studies, for either re-rupture rate or complication rate. Operative treatment reduces the risk of re-rupture compared with nonoperative treatment, but it also results in a higher risk of other complications. These findings are in accordance with those of previous meta-analyses.346 Our review included 10 RCTs with a total of 944 patients, which resulted in an increased number of patients available for analyses, thus exceeding previous meta-analyses. Furthermore, the inclusion of observational studies resulted in an additional 14 918 patients for analyses. The previous meta-analyses reported a risk difference in re-rupture rate varying from 5% to 7% and a risk difference of other complications varying from 16% to 21%.3456 However, with the addition of observational studies, this review shows that differences between treatment groups are small, with a risk difference in re-rupture rate of 1.6% and a risk difference of 3.3% for other complications. Functional outcome measures included the ATRS score, return to sports, and return to work. The ATRS score is the most commonly used patient reported instrument to evaluate limitations after treatment for an acute Achilles tendon rupture.2 ATRS scores were not pooled in this study, but most studies showed no significant difference in ATRS score between the operative and nonoperative treatment groups. Resumption of sports was reported by only four studies; the results indicate no difference between operative treatment (six to nine months) and nonoperative treatment (six to eight months). The pooled effect of return to work showed no significant difference between treatment groups. Wilkins et al pooled return to work data from four studies and also found no statistical significant difference.5 Soroceanu et al reported a statistically significant difference with the pooled data from four studies; operatively treated patients returned to work 19 days earlier than nonoperatively treated patients (P=0.0014).6 Wilkins et al included return to work data in their pooled results from the studies by Nistor et al and Cetti et al.55257 In our study, we did not use the return to work data from these two studies owing to reporting of mean and range and the absence of standard deviations. Soroceanu et al also included the study by Cetti et al, as well as the study by Majewski et al,65262 which we excluded as it was in a language other than English. However, both our meta-analysis and the studies by Wilkins et al and Soroceanu et al are limited by the number of included patients in the return to work subgroup analyses.56 Unfortunately, accurate comparison of functional outcome measures remains difficult owing to differences in protocols, patient oriented outcome measures, duration of follow-up, and presentation of data. We found a lower re-rupture rate after both early and late full weight bearing in favour of operative treatment; this is in contrast to a previous meta-analysis by Van der Eng et al,63 which found no difference in re-rupture rate. The previous meta-analysis could be limited by the number of included patients in the subgroup analyses. In our review, with the addition of observational studies, sensitivity analysis showed a significant difference in re-rupture rate after both early and late full weight bearing in favour of operative treatment. However, regardless of re-rupture rate, timing of weight bearing might influence other outcome measures as shown in different lower extremity injuries. De Boer et al found that early weight bearing regimens did not negatively affect functional outcome after treatment for displaced intra-articular calcaneal fractures.64 Previously, Smeeing et al showed that early weight bearing tended to accelerate return to work and daily activities compared with late weight bearing, after internal fixation of ankle fractures.65 Eliasson et al evaluated tendon elongation, mechanical properties, and functional outcomes during the first 12 months after operative treatment of acute Achilles tendon ruptures.66 However, they found that different rehabilitation regimens did not affect the outcome measures. Further research could focus on the effect of early weight bearing and long term functional outcome after treatment of Achilles tendon ruptures. The sensitivity analyses including studies with a study period after the year 2000 showed similar risk ratios and significance levels regarding re-rupture and complication rate. However, the risk differences between treatment groups were smaller than in all other analyses. The study period sensitivity analyses included one RCT with minimally invasive surgery and four observational studies that included both open and minimally invasive surgery. These findings might indicate an overall reduction in complications after treatment of Achilles tendon ruptures due to the development of new rehabilitation protocols and operative techniques, regardless the use of operative or nonoperative treatment. However, it should be noted that both the level of high quality studies and the study period were arbitrarily chosen. We found no difference in pooled effect estimates from RCTs and observational studies. 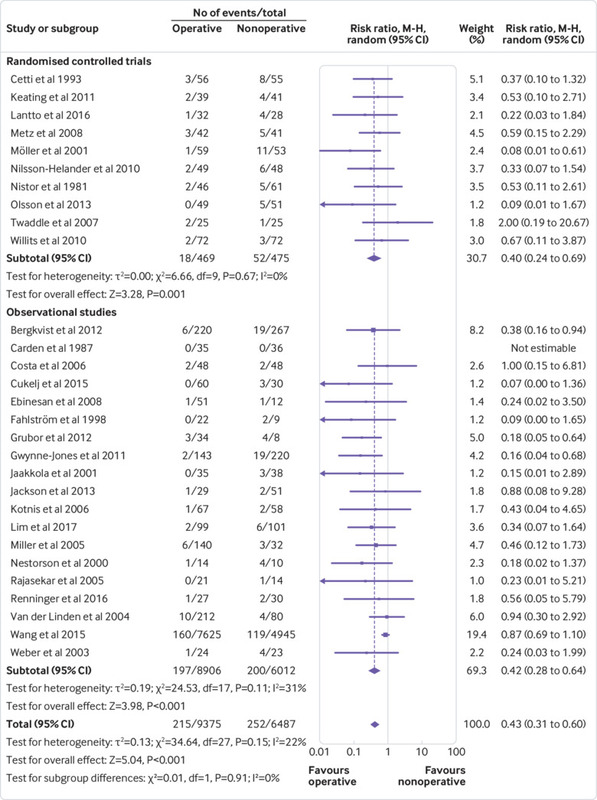 This is in line with previous reports showing that differences in effect estimates between RCTs and observational studies are small.8911131517 Observational studies, however, have also been associated with an overestimation of treatment effects compared with RCTs.6869 Hemkens et al assessed the difference in treatment effect estimates for mortality between observational studies and RCTs.69 They evaluated 16 observational studies and 36 subsequent RCTs investigating the same clinical questions. Overall, observational studies significantly overestimated the effects of treatment compared with RCTs.69 This overestimation of treatment effects could be explained by the effects of bias and confounding in observational studies.70 However, overestimates by observational studies could also be explained by the potential selection bias in RCTs. RCTs require strict conditions such as selection of participants, inclusion/exclusion criteria, randomisation method, and outcome measurements. The patient population in daily clinical practice can differ from the often highly selected patient populations in RCTs, which could be the reason for the discrepancy between treatment effects.7172 Nevertheless, observational studies increase sample size, which could lead to the evaluation of small treatment effects and infrequent outcome measures. Furthermore, the addition of observational studies might provide insight into a variety of populations and long term effects. These results could improve the representation of daily clinical practice, with various levels of surgical experience and differences in operative techniques, provided that confounding has been adequately addressed.1213 In this meta-analysis, pooled effect estimates obtained from RCTs and observational studies were similar. Several orthopaedic trauma meta-analyses including both RCTs and observational studies have shown high quality observational studies to result in similar treatment effects to RCTs.151617 These findings indicate that the effect of potentially unmeasured confounding in high quality observational studies seems relatively small, emphasising the possible benefits of combining different study designs for the evaluation of objective outcome measures after surgical treatment. Several potential limitations in this review need to be considered. Firstly, results might be influenced by missing articles. However, in addition to the extensive electronic database search, funnel plots did not indicate evidence for publication bias. Three studies could not be obtained in full text, but these articles were all published before 1996.262728 Secondly, the methodological quality of included studies was assessed by the MINORS criteria, which do not differentiate between randomised and non-randomised studies. However, the MINORS criteria were externally validated using RCTs and are able to distinguish adequately between study designs, as well designed randomised trials score higher than well designed non-randomised studies.21 The incidence of complications could be affected by the use of different treatment protocols. Five studies mentioned the use of prophylaxis for deep vein thrombosis.5153565859 However, descriptions were not comprehensive and the duration and types of prophylaxis varied widely. Finally, sensitivity analyses for the evaluation of weight bearing status and accelerated rehabilitation were performed using data from both RCTs and observational studies. However, the primary analysis showed no significant difference in effect estimates between the two study designs in terms of re-rupture rate. Operative treatment of acute Achilles tendon ruptures reduces the risk of re-rupture compared with nonoperative treatment, although the incidence of re-ruptures is low and differences are small (2.3% v 3.9%). Operative treatment results in a higher risk of other complications compared with nonoperative treatment, mostly attributable to the increased risk of infection. Nonoperative treatment might be the preferred treatment for acute Achilles tendon rupture, owing to the higher risk of other complications after operative treatment and the relative small benefit in re-rupture rate. However, patient specific factors should always be taken into consideration and patients should be counselled about the incidence of complications. Unfortunately, comparison of the literature remains difficult owing to a wide variety of rehabilitation protocols, weight bearing restrictions, treatment modalities, patient oriented outcome measures, and duration of follow-up. The discordance among studies makes comparisons between treatment modalities difficult, indicating a substantial need for further research. We suggest future research to focus on the effect of comorbidities on the success of treatment for Achilles tendon rupture. Studies could compare outcomes according to different age groups and evaluate effects in a variety of populations such as in patients with immunosuppression, diabetes mellitus, increased body mass index, neuropathy, peripheral vascular disease, and dermatological disorders. Furthermore, future studies should strive to determine the optimal treatment for acute Achilles tendon ruptures on the basis of patients’ expectations. Operative treatment is associated with complications inherent to the treatment itself, such as infection. However, athletic people may prefer operative treatment to enhance and expedite their outcomes, whereas a sedentary person with limited functional outcome expectations may prefer nonoperative treatment.3 We believe that more data are needed for the development of a shared decision making algorithm to guide surgeons and physicians regarding the most appropriate treatment option for each individual patient. In this meta-analysis, operative treatment of acute Achilles tendon ruptures reduced the risk of re-rupture compared with nonoperative treatment. However, re-rupture rates are low and differences between treatment groups are small, with a risk difference of 1.6%. Operative treatment results in a higher risk of other complications, with a risk difference of 3.3%, mostly due to the increased risk of infection. Patients should be counselled about complications, and the final decision for operative or nonoperative management should be based on patient specific factors and shared decision making. Further research is needed for the development of a shared decision making algorithm. Moreover, this review emphasises the potential benefits of adding high quality observational studies in meta-analyses to complement RCTs for the evaluation of objective outcome measures after surgical treatments. Contributors: RMH and RHHG conceived and designed the study. YO, RHHG, RBB, and RMH acquired, analysed, and interpreted the data. YO drafted the first version of the manuscript. YO, OvdM, RHHG, RBB, MH, and RMH drafted the subsequent versions of the manuscript. MvH, FH, LPHL, and DvdV gave clinical advice in interpreting the results. All authors contributed critically to subsequent revisions and approved the final manuscript. The corresponding author attests that all listed authors meet authorship criteria and that no others meeting the criteria have been omitted. YO is the guarantor. Higgins J, Green S. Cochrane Handbook for Systematic Reviews of Interventions Version 5.1.0 (updated March 2011). 2011. http://www.cochrane.org/training/cochrane-handbook.
. Achilles tendon rupture - Operative or conservative functional treatment?Aktuelle Traumatol1996;26:95-100.